Professional music for live performance, licensing, or on demand. These days, Jason has dedicated most of his musical energy to composing. He has been hired to compose a number of soundtracks for video games and won the 2014 Ohio Game Developers Expo Music Demo Derby. Click on the Compositions link to hear examples of Jason's composing. In addition to this, Jason can be seen with the Conspiracy Band; the Aaron Quinn Nonet; Adam Smith; Honk, Wail, and Moan; Clave Sonic; The Daniel Zwelling Orchestra; Soul Kitchen; Descendre; The Bluewater Kings; and his own ensembles. Occasionally, he can still be seen with regional and national acts. Please click on the Jazz Ensemble link to book the bands Jason leads. 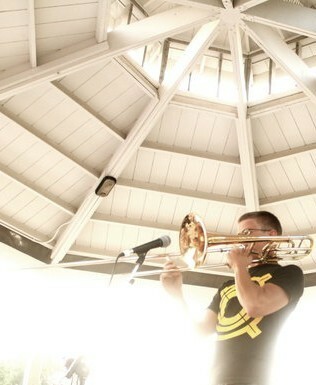 Jason Branscum is a composer, trombonist, bass player, trumpeter, keyboard player, educator, and arranger. Jason was born and raised in Dayton, Ohio and developed a passion for motown, rock, and hip-hop music throughout his teen years, but was tipped over the edge when he discover the jazz and funk from the bars in Dayton. Living in the "Land of Funk," it was easy for Jason to brush shoulders on a regular basis with the people who wrote the funk tunes that were sampled in the hip-hop music with which he had grown up. Jason has performed in Europe, fourteen states and Washington D.C. He has recorded, toured, or shared the stage with Slave, The Hughes Corporation, Dr. John, 10,000 Maniacs, Jonathan Nelson, Sugarfoot and Marshall Jones of the Ohio Players, George Clinton and the P-Funk All Stars, Gladys Knight, Rick James's Stone City Band, Al Wilson, Lewis Johnson, Umphrey's McGee, and Roy Hargrove. Additionally, he has shared a bill with Eric Harland, Dwele, Zapp, Talib Kweli, The Roots, Carl Carlton, Groove Collective, T.S. Monk, The Mary Jane Girls, REO Speedwagon, Tiempo Libre, Gilberto Santa Rosa, and Midnight Star. See the pictures page to see Jason at work with some of these big name artists. Under his own leadership, Jason has led a number of interesting ensembles including jazz groups that range from polished dinner music perfect for restaurants or private events to challenging avant-garde performance. Outside of this, he has also led the bands, metalbaby, Pooma, and Children. These ensembles each had a healthy life with a period of popularity despite their ability to challenge the listener. Currently, he is developing the group Tangatang with drummer Tom Buckley and guitarist Brandon Coleman. Jason has taught at a number of institutions including Music Royale, Noteworthy Music, and Music and Arts, in addition to in-school presentations with a variety of ensembles. At this time, Jason teaches music appreciation courses at Xavier University in Cincinnati, Ohio. As a husband and father of two, Jason is consistently inspired by his family and their growth together. He spends his free time with friends and family either in nature, enjoying the arts, or contemplating the wonders of the created world.